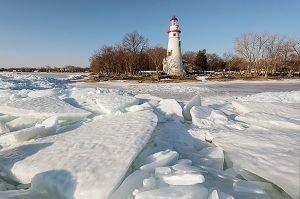 Marblehead Lighthouse, on Ohio’s Lake Erie, is the oldest lighthouse in continuous operation on the Great Lakes, and has guided sailors safely along the rocky shores of Marblehead Peninsula since 1822. The 50-foot tower stands at the entrance to Sandusky Bay. It was built for $5000.00 from extremely durable native Columbus Limestone. The limestone was also used to line the shoreline around the light to protect against waves. The limestone construction is said to be the reason the light has been in continuous operation since its construction. 15 keepers, two of whom were women, have tended the Marblehead beacon. The first was a Revolutionary War veteran, Benajah Wolcott. Each night, he lit the wicks of the thirteen whale oil lamps that were the original light fixture. Other duties of the lighthouse keeper included keeping a log of passing ships, noting the weather conditions, and organizing rescue efforts. Wolcott died of cholera in 1832, his wife took over the keeper duties until two years later when she married a man who became the lights third keeper. A second female keeper served at the lighthouse from 1896 to 1903, after her husband died. Rough job. Keeper Charles Hunter served the longest, 1903 to 1933, as keeper. During the three-month-long winter season, when the light was inactive,—Lake Erie was too treacherous for shipping. —Hunter passed his time with hobbies. He carved a grandfather clock, What?worked yarns into tapestries featuring the light and ships, wrote short stories and the words to the song “The Lighthouse by the Bay.” Talented guy. 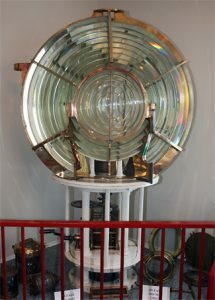 The whale oil lamps were replaced in 1858 by the light from a single kerosene lantern magnified by a Fresnel lens. In 1923, an electric light replaced Marblehead’s incandescent oil vapor lamp, increasing the intensity of the light. No more climbing the stairs! Marblehead’s last civilian keeper resigned in 1943. 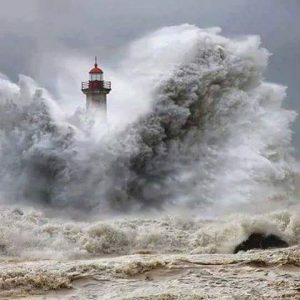 Coastguardsmen then assumed responsibility for the lighthouse. Ohio peeps see the names of any relatives here? Keepers: Head: Benajah Wolcott (1822 – 1832), Rachel Wolcott (1832 – 1834), Jeremiah Van Benschoten (1834 – 1841), Roderick Williston (1841 – 1843), Charles F. Drake (1843 – 1849), Lodowick Brown (1849 – 1853), Jared B. Keyes (1853 – 1858), David L. Dayton (1859 – 1861), Thomas Dyer (1861 – 1865), Russell Douglas (1865 – 1872), Thomas J. Keyes (1872 – 1873), George H. McGee (1873 – 1896), Johanna A. McGee (1896 – 1903), Charles A. Hunter (1903 – 1933), Edward M. Herman (1933 – 1943). Assistant: Clinton D. Egelton (1903), Charles E. Perry (1903 – 1906), Earle O. Mapes (1906), Andrew Turinski (1907), Earle O. Mapes (1907 – 1913), Edward M. Herman (1913 – 1933).